What is a MyRouteYou Enterprise? A MyRouteYou Enterprise account is created for professional organizations that want to use the RouteYou platform on RouteYou (www.routeyou.com) and want to use the 'building blocks' inside their own environment ((mobile) website, app, ...). These building blocks are turnkey solutions and are supported by RouteYou. It allows your organisation to save many costs on development, maintenance and hosting. The full use of these solutions is included in the price of a MyRouteYou Enterprise. MyPlanner on your own website: a route planner on demand for your website, your customers, your community, ... The set-up of a MyPlanner on your website includes the configuration from the existing moduls, maplayers, networks and routings based on your specifications. (This is not: any data-engineering aspects (for example: importing and creating a specific routable network) or specific software engineering (for exameple the development of a specific and new functionality in the route planner). For data-engineering and software engineering we offer you a price on demand. Professional RouteViewer plugin on your own website: it offers your (website) visitors a route (with POIs), completely according your own taste and layout by using parameters (1 route on a map). Professional MapSearch plugin on your own website: it offers your (website) visitors routes (with POIs), completely according your own taste and layout by using parameters (more then 1 route on a map). The use of the RouteYou Web services on your own website, so you can integrate your own content and RouteYou functionalities in a creative way in your own (mobile) website or app. These advanced Viewer Widgets (RouteViewer plugin, MapSearch plugin) are part of the RouteYou Professional Services). So you can offer the visitors of your website an overview of the routes you published on www.routeyou.com and allow them to view these routes on your own website. These Professional Services are part of the MyRouteYou Enterprise. Check out the overview of all functionlaities for the MyRouteYou Plus, MyRouteYou Premium, MyRouteYou Pro en MyRouteYou Enterprise. The whole concept of the MyRouteYou Enterprise requires the public sharing of the content (routes, POIs, groups, ...) on the RouteYou platform. This is the RouteYou website www.routeyou.com, the RouteYou mobile website m.routeyou.com, the RouteYou App for Smartphones and other RouteYou related platforms from partners. This also includes the use of our webservices by partners that uses the on RouteYou published content. The MyRouteYou Enterpise supports the use of the Professional RouteViewer plugin, the Professional MapSearch plugin and the use of theRouteYou Web services on your own website (one website). If you want to support more then one website with this, there is an extra cost (see Price, extra options). (*) The first year ther is a set-up cost. So the first year the cost is 4999 euro for a MyRouteYou Enterprise, after that year € 3999/year. (**) By an unlimted number of Widget Calls we use a FUP (Fair Use Policy). This is not an Dit is dus excepted excessive use. Saying excessive use we mean verstaan we crossiing the normal use of a medium or large website. If you don't know what this means for your organisation? Please contact us: sales[at-r.]. An own smartphone app with (your) recreatieve routes. Read more about the MySmartphone App. For your MyRouteYou Enterprise channel and for your MyRouteYou Mobile you can control and take over all advertising space with a MyRouteYou Enterprise and/or a MyRouteYou Mobile campagne. 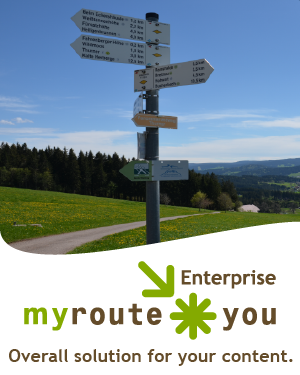 Read more about the MyRouteYou Enterprise- and the MyRouteYou Mobile Campagnes.